EA Sports has released a new NBA Live 19 trailer, spotlighting the authentic courts from around the globe that will be featured in The Streets. The trailer prominently features Hall of Famer Allen Iverson, who confirmed on Twitter that he is part of the NBA Live Squad, and will therefore have a presence in the mode. Cover player Joel Embiid also appears in the trailer. 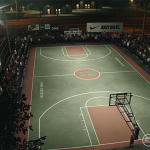 The featured venues shown in the trailer are Quai 54, Rio De Janerio, The Tenement, The Cage, Cherashore Playground, Drew League, Venice Beach, Barry Farms, Kezar Pavilion, Hoop Dome, Margaret Hie Ding Lin Park, Dyckman Park, Seattle Pacific University, and Rucker Park. You can check out some profiles and screenshots of the venues here over on the official NBA Live 19 website. Check out the trailer below, or catch it here on YouTube. What are your impressions of the Global Courts trailer? Feel free to share your thoughts in the comments section below, as well as join in the discussion here in the NLSC Forum!